Cut eggplant in half lengthwise and with a spoon scrape out most of the seeds, creating a hollow in each half. Dice the red pepper and the onion. Place them in a bowl with the minced herbs, celery leaves, garlic and hot pepper to taste. Peel, seed and chop the tomatoes; add to the other vegetables. Stir in the salt, pepper and 2 tablespoons of corn oil. Mix well. Stuff the eggplants with this mixture and place in a large skillet. Add about 1/4 cup of water to the bottom of the pan. Drizzle the eggplant halves with the remaining to tablespoons of olive oil. Cover the skillet and simmer for 45 minutes, or until the eggplant is tender. 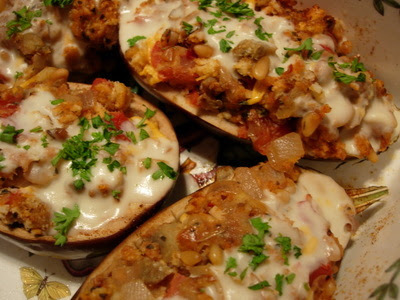 To serve, slice each stuffed half eggplant in half lengthwise.